Shopping for a new BMW M6? Try the Competition’s suspension before opting in. It may be too stiff to drive daily. The 2019 BMW M6 Gran Coupe is a thrilling lame-duck sedan with stunning looks. With the M6 Gran Coupe, BMW has an existential crisis. The 2019 M5 across the showroom is newer—and faster. The 2019 M6 Gran Coupe is older, sure. But just look at it. This year, the M6 Gran Coupe is unchanged from last year and cost more than $122,000. Base M6s are powered by a 4.4-liter twin-turbo V-8 that makes 560 horsepower. M6 Competition models add 40 horsepower for $7,000 more. That power is sent to the rear wheels exclusively through a 7-speed dual-clutch automatic or 6-speed manual. The Gran Coupe’s beautiful roofline plays second fiddle to the V-8s mellifluous snarl, barely. The M6 coupe and convertible are gone now, but the four-door’s looks help us get over the breakup. The roofline reaches rearward from the long hood to the tail. Unlike the A7, the M6 has a (sizable) trunk, and we like its looks. Although it has four doors, the M6 Gran Coupe is best for two people. The roofline cuts into available head room, and the rear seats don’t offer much more leg room than smaller sedans. For the price the M6 leaves us wanting for little. Every car is equipped with 20-inch wheels, leather upholstery, a 10.2-inch infotainment screen, carbon-fiber interior trim, four-zone climate control, soft-closing doors, parking sensors, wireless smartphone charger, Bluetooth connectivity, heated front seats, two USB chargers, and Apple CarPlay compatibility with one year of service included. Not included: active safety features including automatic emergency braking and blind-spot monitors. We consider that to be an oversight for the price. The 2019 BMW M6 Gran Coupe is stunning—speeding along or even sitting still. The BMW M6 has aged well. The M6 pronounces its performance potential with beefy fenders and big 20-inch wheels. Its gorgeous roofline is its calling card, though; its as if BMW took popular four-door “coupes” from Mercedes-Benz and Audi to finishing school. There’s hardly a bad angle found on the M6 Gran Coupe. 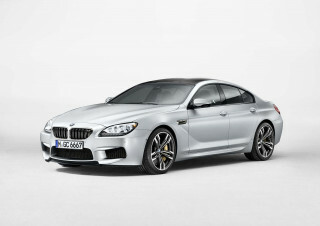 Inside, the M6 cants its dashboard toward the driver and BMW swathes nearly every surface with French-stitched leather. Unlike Porsche, BMW doesn’t offer paint-to-sample options for the M6, though. The 2019 BMW M6 Gran Coupe is in rarified air among performance sedans. Few cars can match the performance of the 2019 BMW M6. Its prolific speed is matched by its tight handling and near-endless grip from wide, 295/30 ZR-rated rear tires. All M6s are powered by a 4.4-liter twin-turbo V-8 that cranks out 560 hp and 500 pound-feet of torque. That power is filtered through a 7-speed dual-clutch automatic or 6-speed manual transmission that powers the rear wheels only. A spend-up Competition version adds 40 horsepower and a stiffer suspension setup for a sportier ride. The M6’s big V-8 snarls and snorts through its quad exhaust pipes. 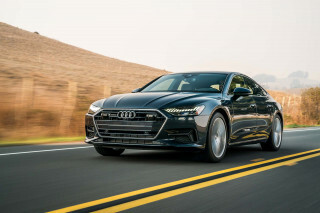 The automatic is the only way to rip off consistent 0-60 mph sprints in 4.1 seconds, but we admit that a manual-equipped super sedan has a certain appeal (and likely a limited future). The standard sedan tops out at an electronically limited 155 mph, while M6 Competition versions run all the way up to 186 mph. An electronically controlled rear differential metes power between the rear wheels in predictably thrilling ways. Driver-selectable modes can toggle throttle sensitivity, shift points, and suspension firmness, but a separate traction control setting can let drivers dial in more slip from the rear wheels, too. The M6’s heft is prodigious: about 4,500 pounds without passengers aboard. Its standard suspension leans toward firm to cope with the weight and sporty mission; the Competition’s firmer settings go further. We suggest shoppers try before they buy, the Competition’s setup could be too firm. The standard brakes on the M6 are stout, but optional carbon-ceramic brakes resist fade even more after a hard day of driving and cost $9,250 more. They’re grabbier around town, though, and typical services and replacement pads can run thousands. Unless track days are on your calendar, we suggest skipping those pricey stoppers. The M6 coupe and convertible are gone, just the four-door remains but we say it’s still a two-person car. The 2019 BMW M6 is available only as a four-door sedan this year, two-door coupes and convertibles are long gone. It’s beautiful and breathtakingly fast, but not for a crowd. The heated front seats are spacious and comfortable, with a wide range of adjustability for many body types in 14 ways. Optional upgrades add cooling, more adjustability, and active bolsters to hug front-seat riders in turns—if you’re into that sort of thing. The rear seats can be optionally heated as well, but no amount of money makes them easier to access. Just 34.2 inches of leg room are offered to rear-seat passengers, which belies the sedan’s overall size, and the rear doors are relatively small. That said, the trunk’s 16.2 cubic feet of cargo room is spacious. The 2019 BMW M6 lacks official crash-test data. Federal and independent testers haven’t ruined an M6, and we don’t expect that to change. 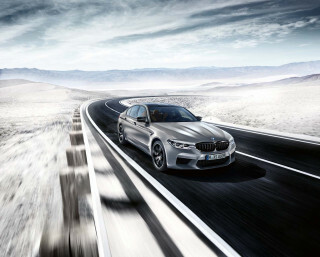 Aside from official crash data, the M6 is equipped with standard belts and ‘bags for all passengers, and a telematics system that can alert first responders if the car is involved in a serious crash. Adaptive cruise control is standard on all models. A spend-up safety package adds blind-spot monitors, forward-collision warnings with automatic emergency braking, head-up display, and lane departure warnings for $1,700. For safety (and to protect the sizable investment), we recommend it for all cars; we just wish it were standard. Outward vision in the low-slung sedan is challenging, especially from the rear. There’s plenty of good stuff in the 2019 BMW M6, but not much of it is free. Few cars are as well-equipped as the 2019 BMW M6, but the six-figure super sedan critically misses some elements others now offer. The M6 comes in two flavors for 2019: regular or Competition. The latter adds 40 horsepower and a sport suspension for $7,000 more than the car’s base price of more than $122,000. Every car is equipped with 20-inch wheels, leather upholstery, a 10.2-inch infotainment screen, carbon-fiber interior trim, four-zone climate control, soft-closing doors, parking sensors, wireless smartphone charger, Bluetooth connectivity, heated front seats, two USB chargers, active safety features that we cover above, and Apple CarPlay compatibility with one year of service included. BMW charges $80 per year after the first year for Apple CarPlay compatibility and they’re alone among automakers in asking for more money, even on six-figure luxury cars. More than our smartphones, the M6 critically lacks standard automatic emergency braking, which is part of a $1,700 spend-up package that includes a head-up display and blind-spot monitors. A luxury package adds cooled front seats, premium audio, heated steering wheel, and heated rear seats for $5,000. Might as well if we’re already in for more than $120,000, we’d say. Brace yourself to spend thousands more, too. A surround-view camera system costs $500, carbon-ceramic brakes are $9,250, and a night-vision camera system is $2,300. We have good news, though: a manual transmission is a no-cost swap. Allow us to state what’s obvious: The 2019 BMW M6 isn’t fuel-efficient. The 2019 BMW M6 doesn’t sacrifice much for its looks and speed, certainly not fuel economy. Opt for a manual and you’re closer to our hearts, but not much closer to frugal. Manual-equipped M6 versions rate 15/22/17 mpg. 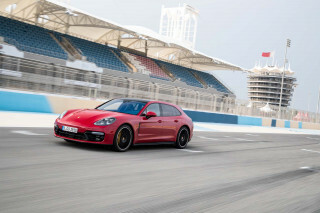 The Mercedes-Benz E63 AMG rates similarly with its big V-8, but the Porsche Panamera Turbo tops 20 mpg combined and offers a plug-in hybrid powertrain. Looking for a different year of the BMW M6?